Step aboard one of our tour boats and we will take it from there. 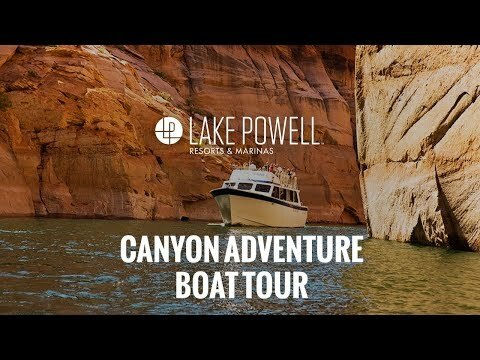 Relax and prepare to cruise through two famous Lake Powell Canyons - Antelope and Navajo Canyons. This tour offers some of the most breathtaking views on the lake. Don’t forget your camera! Glen Canyon Dam - See the second largest concrete arch dam in the United States. Antelope Canyon - Experience the Antelope Canyon, which is over 10 miles long. You will view approximately 4 miles of the canyon wall before it narrows. Navajo Sandstone - View towering Navajo Sandstone geologic formations with stunning red and burnt orange rocks. Navajo Canyon - The Navajo Canyon walls are 600 feet above the water. You will see "desert varnish", also known as Navajo Tapestry, on the sandstone walls. 50/50 Wall – As high as the rock is above you, it is equally deep below you. NOTE: This tour lasts approximately 3 hours. Due to fluctuating water levels, this tour may take longer than planned. The winter tours will run if there is a minimum of 15 passengers booked on the trip 48 hours prior to departure. Please call 928.645.2433 within 48 hours prior to your scheduled departure to check on the trip status.